It all started with two legal documents that seemed to attest to the same event. And this event was John Ulrich Kreis’ US naturalization. The New Orleans Public Library offers a clear and comprehensive guide to naturalization. How I came to have this document in my possession is important to all who study genealogy. My good friend, Gary Kriss, the co-administrator of the Kriss/Krise/Kreis/Kries DNA Surname Project, found it on Ancestry. This is an example of the reason for every genealogist to build a community of fellow researchers.You will benefit when you share information with others, help others with their brick walls, and follow the thinking processes of those in your circle. A few months after John’s 1878 Certificate of Naturalization from New Orleans came into my possession, I had another piece of luck. Once again a genie friend led me to a great discovery. We found John Ulrich Kreis’ granddaughter, J.D., by his second wife, Henrietta Hausmann Williams Kreis, living in Essex County, NJ. I discussed this wonderful experience in my post of March 16, 2012. It is through J.D. that John Kreis’ second citizenship document came to me. J.D. sent me a document titled “Certificate of Citizenship” and issued by the United States Bureau of Naturalization (under the Department of Labor from 1913-1933), dated September 26, 1931,which bestowed US citizenship on John U. Kreis for a second time in 53 years. This was very puzzling. I sought guidance from a wise friend in NJ on this puzzle. I was thinking of checking with the National Archives and Records Administration (NARA) but had been procrastinating. My friend suggested contacting Homeland Security. I had not even thought of that. But that is after all where naturalization is handled now. I went to the main Homeland Security website and at the bottom of the page found the U.S. Citizenship and Immigration Services (USCIS) link. At first glance didn’t find anything about naturalization history (if I had scrolled down to the bottom of the page, I would have seen “genealogy” listed in the topic area.) But when I clicked on “About US”, I saw “History” on the left column and clicked on that. And here is where I got lucky. In the right-hand column appeared: USCISHistorical Reference Library. Now as we genealogists all know, libraries are wonderful resources. 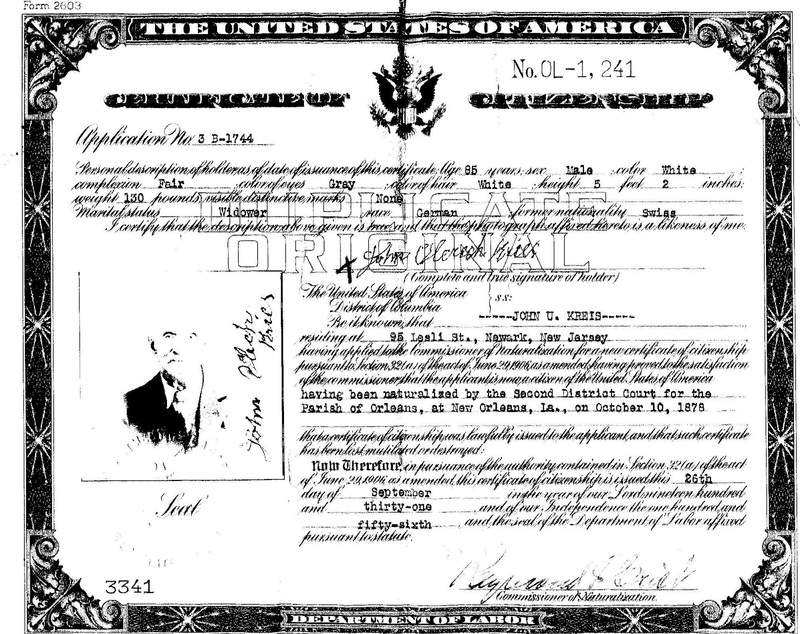 “Your great-grandfather had an “Old Law” Naturalization Certificate. The Federal government did not start keeping copies on naturalization records until Sept. 27, 1906. Before that date, only the naturalization court had copies of the naturalization record and the court gave the original naturalization certificate to the new citizen. Many certificates were lost, stolen, damaged, or destroyed, however, creating an issue for the naturalized citizens (and courts trying to confirm the proper holder of a certificate – There were no pictures in the records). I had my answer! And there on the USCIS on-line genealogy brochure was the same newly re-issued “Old Law” Naturalization Certificate as John Ulrich Kreis had. “Before 1956, issuing of an Old Law Naturalization Certificate created a (Naturalization) Certificate File (“C-File”). Although most C-Files are numbered “C-########,” your great-grandfather’s Certificate Number is “OL-1241” (for “Old Law”). I sent away for the file and will share what I learn in a future post.